We’re a week out from launching a new blogging service – a project that has had a number of false starts and delays along the way – and I am so impressed with the work the team have done to get this there. There’s a description of what we’re aiming for in our new Academic Blogging service on our Projects website. Part of what we are doing is making better sense of the things we’ve been supporting for a number of years: VLE blogging tools; ePorfolio blogging tools; custom WordPress builds. The major missing parts though are (we think) a shared free-to-use WordPress blogging platform, and a Domain of One’s Own offering. We’ve focused on the shared free-to-use WordPress blog in this first phase, so what’s in the box on 02 October? We’re using NSCloner Pro to deliver out a simple default template (thanks to Open ETC friends, especially Grant Potter for the hot tip here) and in time hope to use it to build out more default template options as well as give some useful ability to clone and backup sites as part of support work. We’ve also linked the registration process to our Central Auth service, so we can check what kind of user is trying to register, and if they’re a member of staff or a PhD student, they can register a site on demand, and we’ll pick up their identity details automatically to create their account. We’ve extended the registration process to capture what kind of blog is being set up (Teaching and Learning blog; research blog; personal blog – there are a few categories). Behind the scenes we’re salting this info away along with the creation date and in the next iteration of the project we’ll be developing an archiving and deletion process based on this info (for example when an academic colleague leaves, you don’t want to delete their comments on a student blog, but you probably do want to delete their personal blog). We’ll be driving this based on info in our Identity Management system with all the appropriate grace periods, notifications and archive copies to make sure we hit the right balance between caution and proper and appropriate retention of personal data. We’ve created a plugin to swap out WP native authentication for our institutional web single sign-on solution, which means you can only get into the service to edit blogs if you have a registered University account. We’ve built a new theme, based on the Edinburgh Global Experience Language (EdGEL) the UI components that define our main University website. Serious kudos in here to Callum Kerr, who has pretty much taught himself everything about WordPress themes on the fly as he’s delivered this. We’ve also built a custom footer plugin that adds an institutional footer to every blog, over and above what’s in the theme. This makes sure some important stuff like accessibility help and guidance can be made visible on every page. We’ve had a long think about tracking and what’s appropriate. Initially it was suggested that we use the main University Google Analytics tracking code in the service. This has some advantages in that it will allow user journeys to be mapped across sites. However, because a large number of University web editors are able to report on this data, it will also allow private student blogs to be tracked by audiences that have no real reason to be given such access. What we’ve decided to do is embed our own GA code into the service to give my team access to usage metrics in order to do capacity planning; and then install a GA plugin which will allow an other GA code to be added in by the user. That will allow the main University GA code to be used where it’s appropriate, or any individual to add in their own one. We’ve also create our own custom cookie banner, based on the same code as we have used on the main University website (with options to opt-out of GA tracking, obvs). You can see the sort of functionality we’ve developed on the ed.ac.uk site. As a result of the cookie audit, and some pretty horrible practices around loading up social media APIs even when plugins aren’t enabled, we’ve also created a not-creepy social media sharing plugin. We’ve created a plugin to make embed codes from Kaltura work – so it’s as easy to embed a video from our media service as it is from YouTube now. The final piece of the tech puzzle is the LTI plugin that we’ve written, to make it easy to drop a WordPress blog into Learn or Moodle (the two VLEs we support centrally). We really want to lower the bar to using WordPress significantly and making it as easy as possible to get the right group of students into the right blog is important. We’re using WP Pusher to keep all this code up to date from our institutional GitLab repos. Edit: I am reminded that we’ve also included the much-overlooked Open Attribute plugin, that allows you to embed a range of open licenses into your site (and vary the license down to a post by post basis if you need to). We’ve also installed a compact and bijoux selection of themes, and a few old favourites in terms of plugins (FeedWordPress amongst them). Multisite Privacy, Multisite Plugin Manager, Batch Create and Add Multiple Users are all staples we’ve been using for a while on other WP multi-site installs we run and they’re in the bag too. 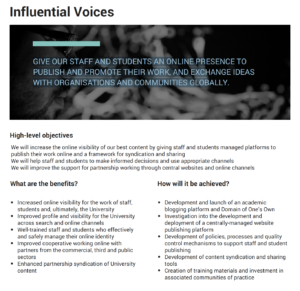 We’ve developed a couple of workshops that we are piloting in the next few weeks: One on using blogs to support your professional development and one to introduce the range of options open for using blogging in learning and teaching contexts. There will be more to say here in the future for sure. Our summer intern Lila has also put together a really great set of online support resources and I’m really pleased that she’s agreed to stay on and work with us over Semester to keep building on these as we develop the service (you should totally check out the awesome interns blog that she and Cecily – our open content intern – built over the summer). 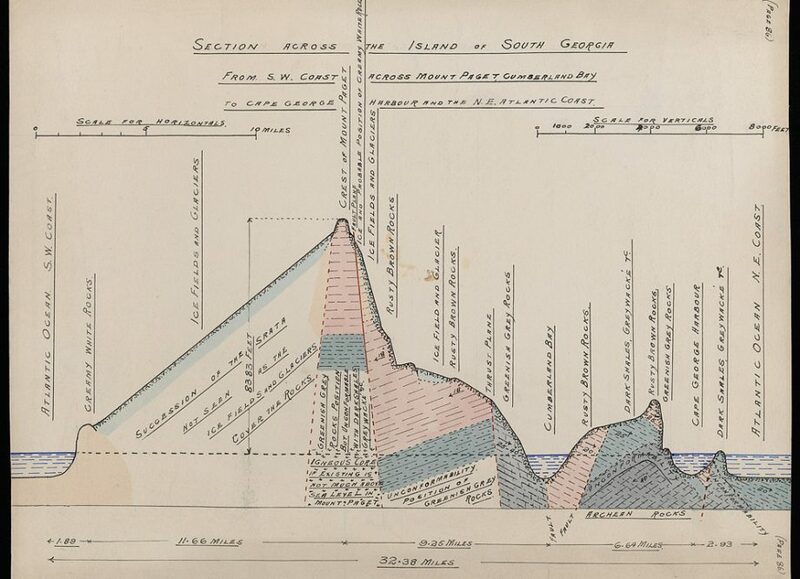 We’ve worked with our colleagues developing a new Web Strategy to ensure that blogging is counted as one of the important digital communication channels we use as an institution. 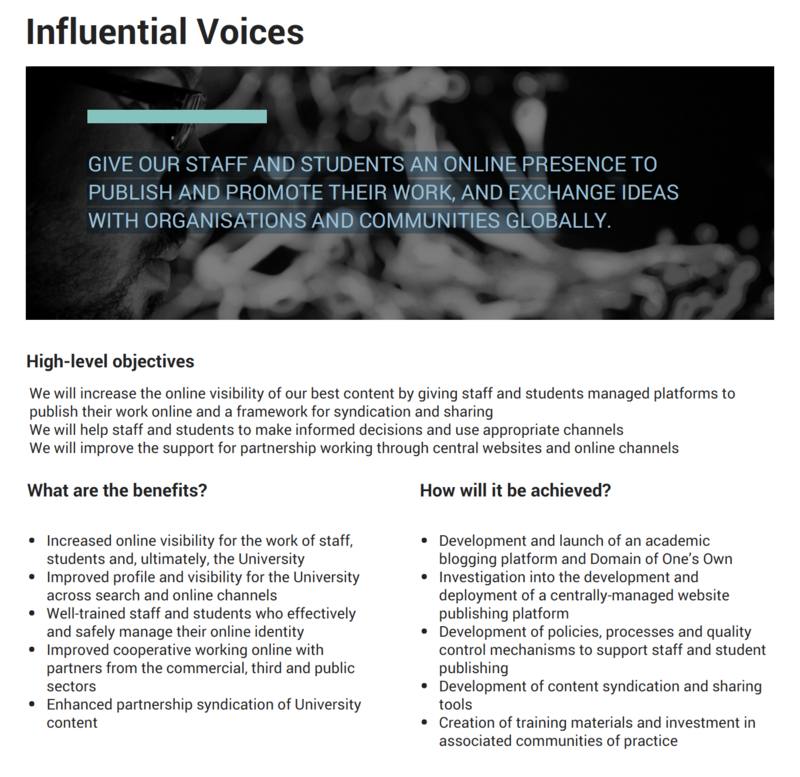 We have a whole section in the Strategy now on “Influential Voices” recognising the importance of the blogging service in this wider context. So what will the first users get? After registration, or via an LTI link, new sites are created with the institutional theme selected, some initial setup and config of plugins done for you, and a first post that uses an image from our University Collections and suggests that you might want to see what else is in the Collections that you could use for free and with open licenses. 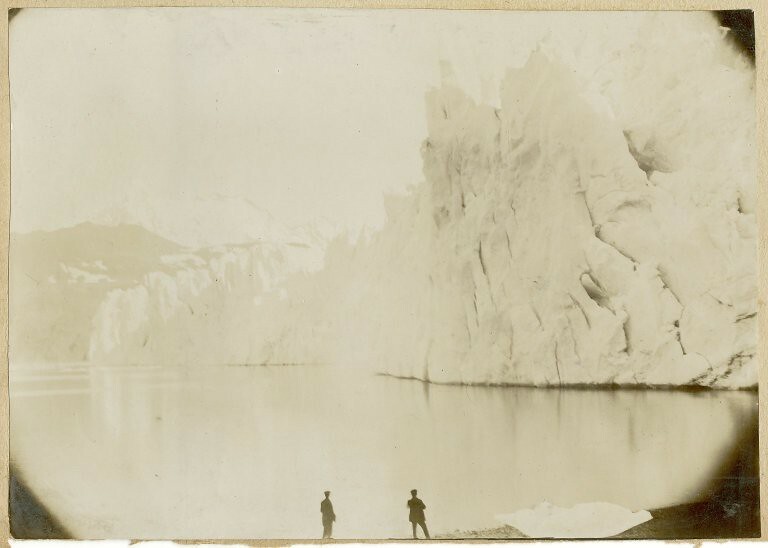 We’ve used one of our favourite open licensed images in the default post – a view of South Georgia from the Salvesen Collection of Antarctic photos. The eagle eyed amongst you will spot not only the contemplation of wide open space (it’s a metaphor dontchaknow) but also the entire lack of penguins, or indeed bird-life of of any kind. Since there’s no rest for the wicked, next steps after we go live are to start working on a next round of updates. Some more themes, and plugins that were taking longer to audit or that we held back to keep the first cut of the service tight and focused on building a solid foundation (SPLOTS! JetPack!). We’ll be packaging up the various plugins that we’ve developed and making them available either to a wider internal audience (our SSO plugin for example) or the world at large (the LTI plugin and the cookie control one). * We ran into a limit on the Registration template add on that limited it to being able to find only the most recent 200 sites as choices for the template; they quickly fixed it, but I believe it may now be limited to 1000 (we are currently at 900 sites on the server). NS Cloner folks were quick to address it. * We are living with the default form presented by wp-signup.php with a dash of custom CSS; I looked a little into how this is customized and got unclear information on how you create your own w/o editing a core file. We skirted this by sending new users to a welcome page that explained all the options, provided links to the sample templates, etc. * Thanks for the list of multi-site plugins; I also found useful Multisite Enhancements https://en-ca.wordpress.org/plugins/multisite-enhancements/ as I was also able to tap into it’s functions to generate my own Network Dashboard admin (and also to create an export data file for all sites created via the cloner). * That’s such a smart idea to add extra form elements to the registration template to be able to look at blogs by groups, etc in the future; I could not explain it well enough to my clients, and missed the opportunity on the first time. * Are you doing anything to automatically add new blogs to a Feed WordPress site? I was curious if it was possible to hook into the site creation process to do this, for an admin use FWP site. Otherwise, there’s not much way to be able to see/share activity across sites. Go Edinburgh, go! Light up the blogs. Thanks for all the really useful hints and tips – I’ve shared them with my team here already. We’re new to some of this so we always appreciate hearing stories from people who’ve walked the path before us. I *think* after doing a hasty check on our test site, and looking at the code in GitLab, that we’ve built a plugin with a variety of helper things in it to achieve some of the things you mention above. I can see a class to construct the category drop down list, a class to pull public posts from across the network and display them on the top level network site, a class that shows logged in users all the sites they currently are admin on etc. I need to check with my team about exactly how the form elements are added into the wp-signup.php page. I rather hope it’s added via this plugin in sort of the same way as NSCloner does (I assume there must be some sort of hook, but maybe we did hack it). I shall enquire….